DDA designed and developed a variety of print and online marketing materials for the Pain Management Centers of New England to help patients peacefully manage their pain. The Pain Management Centers of New England is based in Massachusetts and specializes in treating acute and chronic pain conditions. DDA began work on their new marketing campaign by designing their logo, business cards, and letterhead, as well as designing and writing their brochure, and now they wanted to continue their efforts for patient and physician acquisition online. Using the same themes as in their print materials, the Pain Management Centers of New England wanted to ease their patient’s pain as well as their fears about how different pain conditions and treatments can affect them. All marketing materials needed to bring about these feelings of hope while informing patients of what they can expect from the Pain Management Centers of New England. 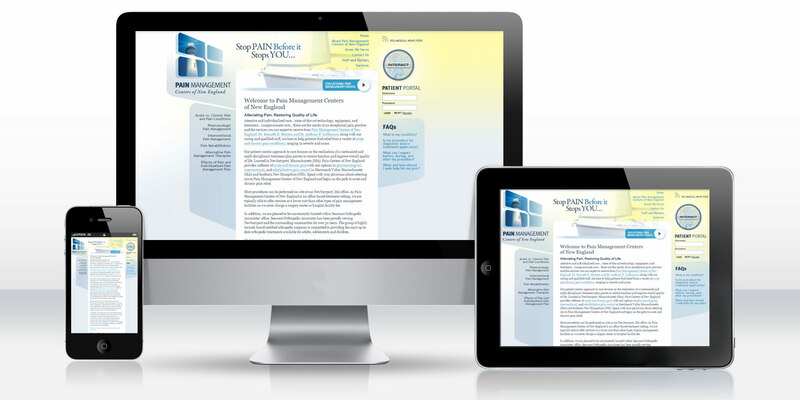 To supplement the print marketing campaign already put in place, DDA Medical would design, develop, and program a website geared toward sharing information about the variety of pain conditions treated and services offered by Pain Management Centers of New England. In the same way DDA designers infused an atmosphere of calm into the logo, brochure, and other print materials, they carried that theme over to the website using cool, tranquil colors such as light yellows and blues. The sea theme not only matched the Center’s location, but also elicits feelings of relaxation needed to help patients manage their pain. The website content was researched, written, and search engine optimized by our staff of in-house professional copywriters. There’s also a secure patient portal programmed into the site where registered patients can maintain an ongoing treatment journal and keep track of prescribed medications. A multimedia video center and interactive map of the body was also integrated into the site, and provides users with an engaging way to learn about common pain conditions and the treatments prescribed to treat them and restore quality of life. Through a comprehensive marketing campaign, including both print and online media, DDA provided the Pain Management Centers of New England with attractive imagery, audience-appropriate content, and interactive features that all contribute to a strong practice identity.